Pretending that your birthday is not a big deal, is difficult. You read or watch about people ‘forgetting’ their birthdays, I think that’s as fake and futile as the Miss Universes hoping for world peace. Once every 365 days, you stop and realise you live to see (hopefully) another 365. The deal here, is pretty big. How you approach it, now that’s subjective. Last year, I had a photo shoot to celebrate my birthday. This year, I don’t know, after coming back from a 4-week-3-country trip and a back-to-back weekend wedding not too long ago, I just could not summon the energy to plan nor celebrate. Chika suggested we go somewhere special for dinner. I opened my list (yes there’s a list) of to-go restaurants, and after fumbling through online booking forms and strict reservation policies, I just gave up. Let’s just forget about it, I said. The more you expect it to be special, the bigger the let down, I said. So on my birthday, I tried to live a normal day. 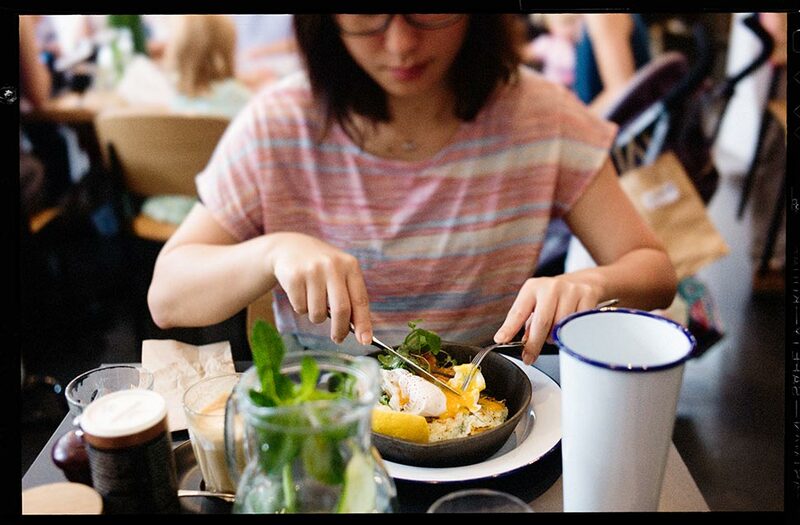 We drove to South Melbourne Market to have brunch, even though Victoria Market was closer. Chika insisted I bring my small Leica, I took one photo in the end: the one above. We saw $6 croissants, got over the heart-attacks, and bought two. Only to return for the third with chocolate stains on my lips. I finally seasoned my cast iron pan with luxurious flaxseed oil. And while it baked itself in the oven, I processed photos. Finished laying out a wedding album. Updated my OSX to Mavericks. Got around to updating the font of this website. Chika was cooking dinner and I chose her favourite dish, korokke, so she would make it better. I spoke with families on the phone. Nearby neighbours dropped by to share our experimental Green Tea Tiramisu. After they left, we watched 2 episodes of season two Fargo. But I told myself it’s special. *Not really 21 but you know.